Originally released in 1996, the CyKey was a designed as an inexpensive means to enable people to employ the chording technique originally developed for the Microwriter to enter alphanumeric data into a PC or PDA, such as a Palm Pilot. One could always enter data to your PC using the serial connector. However, that was cumbersome, and, it required an entire Microwriter, rather than just a keypad, which is what the CyKey provided. The other thing that the CyKey brought to the equation was the ability to use it with either the left or the right hand. Hence, despite the additional keys on the keypad, it used the standard Microwriter codes. The extra keys were to accommodate left or right handed use on the same physical device, and to compensate for the slight asymmetry in the Microwriter (and AgendA) keyboard layouts. 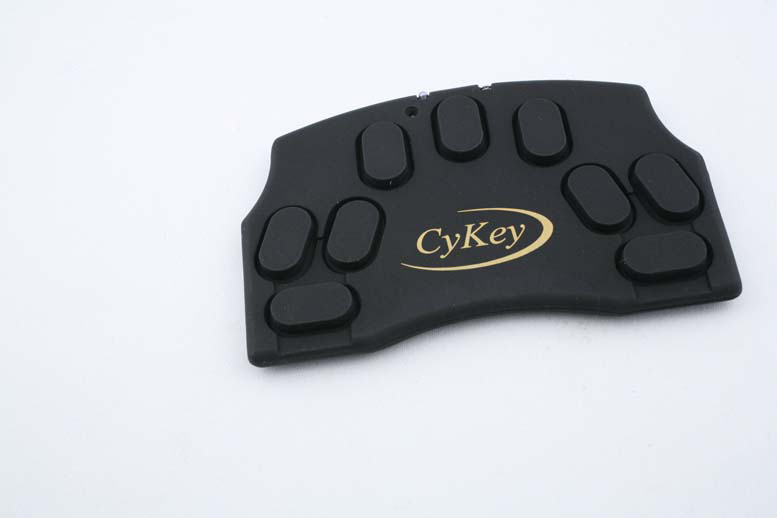 In an updated CyKey it was apparent that the original design of the CyKey was rather clunky and was done on a shoe string. During the life of the product it was criticised for being rather large, noisy (clicking keys), a left hand version was a special, the cable connecting the unit to the PC was a nuisance. In order to address the problems the Mk 2 CyKey specification evolved. The size was set by using the ergonomics that were so successful on the AgendA. So the basic key set up of the AgendA set the position of the CyKey keys. The AgendA keys can be superimposed on the CyKey. .
To address the problem of having the single unit for LH and RH operation I noted that a mirror of the AgendA key meant that we had 2 little finger keys and the key had to be elongated to accommodate the antisymmetry of the AgendA keys. 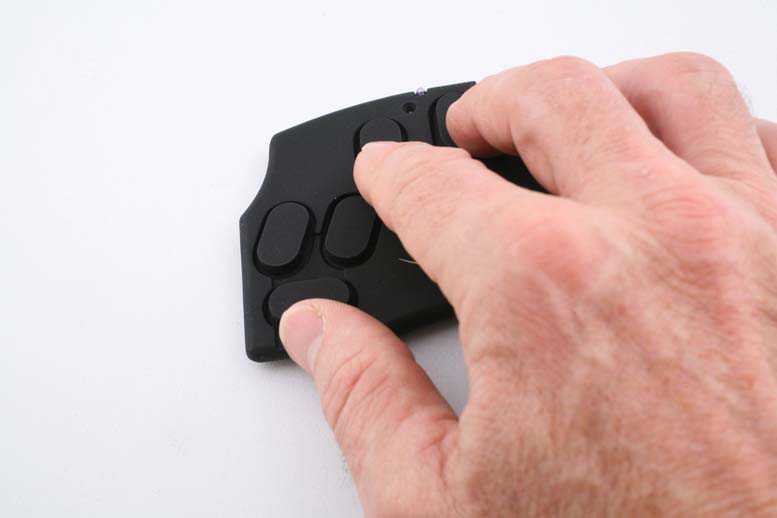 This turned out so be advantageous as it gave a bigger surface area and gave 2 keys with which you can press with the little finger, thereby answering a further problem which is that young children had a job spanning the full keyboard. The cable was done away with by using IR (this was chosen as it has the potential to be very low power - 12 months + battery life). A lot of work was carried out to ensure that the error rate was very low by having a strong error checking algorithm.